2 ingredients + Fruit.. are you kidding me this is so easy! This is another one of those less than 5 ingredients, I can't believe how easy this is kinda recipes. Had I been given more than 2 days notice I would have planned to go... damn! WEST NYACK, NEW YORK – With more than 50 vendors featuring a wide assortment of gourmet chocolates and other delights, Chocolate World Expo 2009 is expected to be among the largest retail-level chocolate shows in the United States. This event, which will take place on Sunday, March 29th, at the Palisades Center in West Nyack, NY, 11am-7pm, will also offer an outstanding selection of baked goods, specialty foods, ice cream, cheeses, wine and beer. As an extra special bonus to the first 4,000 attendees, Chocolate World Expo sponsor Viva ® Paper Towels will be providing free ice cream sundaes! Proceeds will benefit Camp Venture’s programs for children & adults with developmental disabilities. Alright Ladies, this one is strictly for y'all! I reviewed the Smooth Away hair removal 'system' a few weeks ago and now... I have one to give away!! It just dawned on me that Easter is 3 weeks away and I haven’t even started planning the Easter basket for The Kid. I don’t put a lot of candy in his basket, he’s not a big candy eater. I put some candy in there, but I like to do unique things, last year it was a few traditional Easter candies like Jelly beans, Peeps, cadbury eggs, reeses and m&m’s.. But I also hid a whole bunch of Astronaut Ice cream in there that I got off ThinkGeek (man, I love that store!) And a game for the Wii. I’m stumped this year though! Come on Moms and Dads I need some Great Easter Basket ideas.. I always love to *WOW* The Kid on Easter morning. I haven't made whoopie pies in a long time.. and the only recipe I have is for chocolate and I've been so good not to have any chocolate since I gave it up for Lent so finding a really good whoopie pie recipe that is not chocolate was like a gift dropped right into my lap (or, as the case may be, my inbox) This came to me via the Delish Newsletter, which is one of the many foodie related newsletters that make their way to my inbox on a daily basis. 1. Make the cakes: Heat oven to 375 degrees F. Sift the flour, baking powder, salt, and baking soda together and set aside. Beat the butter and 1 cup sugar in medium bowl using a mixer set on medium-high until light and fluffy. Beat in the eggs, one at a time. Mix the vanilla and milk together and add to batter in thirds, alternating with the flour mixture, until combined. Stir in the lemon juice and zest. 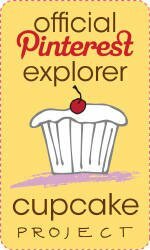 Pour 1/3 cup of batter into each section of a nonstick muffin-top pan and bake until the cakes test clean with a toothpick and are golden around the edges -- about 10 minutes. Cool on a wire rack for 5 minutes. Release from the pan and cool completely. I have a little time to myself in the office right now, everyone’s at lunch and it’s pretty quiet (which is good because I had a hell of a night last night and this morning was insane here!) So being I passed on lunch today because my stomach is quite knotted and I decided to take advantage of the solace here and browse through FoodGawker and TasteSpotting. 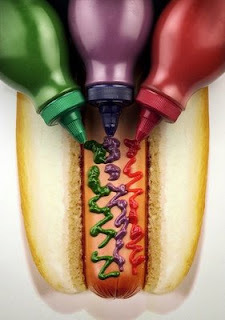 Searching through the pages of both I saw the same photo and caption for Blue Tacos, and it made me remember a few years back when Heinz was making colored Ketchup. I remember it in green, red, blue pink and purple (Ewwwwwwww!) I bought the Green one on request by The Kid and he took one look at it on his hamburger and on the plate with his french fries, looked at me and told me he wasn’t hungry anymore.. He must have been about 4 or 5 at the time.. So funny.. It sat in the fridge for months until I finally tossed the whole damn bottle. I have a thing against eating food that isn’t the color that it’s supposed to be.. Blue soda, ice cream that’s just a little too green or a neon color that just does not naturally occur. A few weeks ago I got a survey in my email from Cowgirl Chocolates so I filled out my survey and then went about my day.. well, just the other day in the mail I got a small package from the Lovely Marilyn at Cowgirl chocolates as a thank you for filling out the survey. And now.. I am going to share these lovely, delicious chocolates with one lucky reader. You don't have to do anything special.. just drop me a comment and make sure that I'm able to reach you via email through your comment. Ends Sunday 3/15. Cowgirl chocolates are chocolate with a kick, they're smooth and delicious and if I could I would eat 'em all myself.. BUT.. I'm allergic. It wasn't until I had my first taste of cowgirl chocolates that I discovered it, but I have a cayenne pepper allergy and that is one of the key ingredients that give the chocolates their kick. One of my very favorite comfort foods is Chicken & Dumplings. Today we're in for a whopper of a snowstorm that went from an estimated 3-5" on Friday up to 6-10" last night and then just a little while ago when flipping through the channels saw that it's gone up to 8-14" I've had enough of winter already. I then put the chicken into my trusty stock pot and cover it with 2 quarts of water, 1 small onion, sliced, 2 cloves garlic, smashed and then let it go for about an hour. After the hour is up I add in a big bag of frozen mixed vegetables, check the seasoning and adjust it to my liking and then it's time for the dumplings. I will confess here, I don't go all out rolling dough for dumplings.. I make Bisquick dumplings. There is nothing like the little fluffy clouds of dumplings that you get from Bisquick, that's how my grandma made 'em and that's how I do it too. (Pancakes too, but that's another day) Bisquick dumplings are so easy! 2 1/4 cups Bisquick and 2/3 cup milk, mix in a bowl until doughy and add to hot liquid. Cook uncovered for 10 minutes, cover and cook another 10 and you're good to go!